A bone scan is a necessary procedure to help diagnose and track various kinds of bone diseases. A doctor may order a bone scan usually if you have skeletal pain that cannot be detected by standard X-ray. 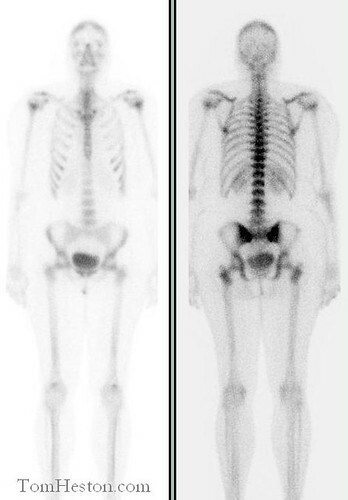 Moreover, a bone scan can help detect cancer, leukemia, and lymphoma. If your doctor orders a bone scan, it is important that you are prepared when it comes to the cost of the procedure. Check out how much a bone scan costs these days. A typical bone scan cost is $150 to $600. This price includes submitting the patient to a nuclear scanning test and analyzing scanned pictures by an expert radiologist. A technician will inject a radioactive tracer into one of the arms and the patient has to wait two to five hours for it to be absorbed by the bones. The tracer will work to identify which parts of the bone have problems. Hot spots are areas of the bones that absorbed more tracer than necessary, which indicates a bone problem. Insurance. A bone scan is covered by most insurance policies. Hence, if you are insured, you usually can expect that your policy will cover 10 to 40 percent of the total cost of the bone scan. Insured individuals usually pay $150 to $200 only for a bone scan while uninsured individuals pay up to $600 for the procedure. Geographical location. The location of the clinic or hospital you are getting a bone scan from can also affect prices. Expensive cities like Florida and New York have usually expensive bone scans as compared to smaller cities and suburban towns. But usually, facilities with a large patient base can charge lower for a bone scan as compared to facilities in rural areas. Patient’s condition. Your medical condition can also affect prices. This is true because if you are unwell, you may need more care and monitoring during the bone scan such as getting the help of a nurse, anesthesiologist, or a specialist. Standby health care providers are usually needed in times when a patient develops complications during the test and may require immediate treatment. In some cases, your doctor may order an additional imaging—the single-photon emission computerized tomography or SPECT. This procedure will help analyze conditions deep in the bone or in places that are difficult to see with the previously scanned images. Tell your doctor if you are pregnant or you think you might be pregnant. There are risks of radiation exposure to the fetus so you have to be open with this information with your doctor. There is a little risk involved with a bone scan as compared to what X-ray can offer. However, it is still good for you to note that a bone scan provides a little radiation exposure and rare allergic reactions. Find a doctor/facility that is reputable, credible, and experienced in terms of bone scan procedures. You may also want to discuss with your doctor the costs and rules and regulations of the bone scan prior to getting one. Also, talk to your insurance provider to check out how much they will cover in the total cost of your bone scan.